From this blog's inception it has always been my intent to have a different focus. What I mean by different is that I don't spend a lot of time talking about the business and writing side of my life, instead trying to focus on other aspects that some readers may find more interesting. I think -as a general rule- that adjectives, three-act plot formulas, and character backgrounds are best left to the final draft. Nobody wants to read about those things unless they happen to be a writer, and blogs on the subject of writing and publishing are so prolific that you can't turn around without tripping over one. So in my effort to reveal other parts of my life that you may find interesting, I sometimes blog about some of my other projects. 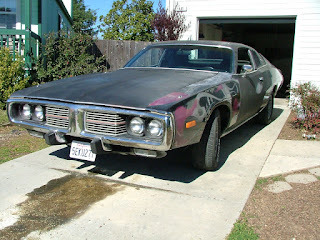 Today, I want to show you my 1973 Dodge Charger. I bought the car in 2004. It wasn't as big of a project as the '66 impala that I restored with my son, but I had my work cut out for me, especially because of the modifications I wanted to make on this car. Here's my confession: I have a dream car, a white unicorn as the characters in Gone in 60 Seconds described the '67 Mustang Eleanor (she was a '73 Mach 1 in the original flick). My white unicorn is a 1968 Dodge Charger. I think it's one of the coolest cars ever made, and if I ever get my hands on one, I'll probably keep it for the rest of my life. Obviously, the '73 was something of a runner-up. It wasn't nearly as desirable, but it was in my price range and I saw the muscle car's potential. I had it shipped from southern California. It arrived on a flatbed truck. The body damage was more extensive than I had been led to believe by the seller. It also had bad ball joints and tie rod ends and about a dozen different electrical gremlins. I just barely managed to keep it running long enough to get it in my driveway. As you can see from the stain on the driveway in the picture below, it also had transmission problems. Oh, and it was also covered in purple and silver flames. Yeah, purple. I had an idea for this car, something I hadn't seen done before. I wanted to make it more like the quintessential Dodge Charger that I'd fallen in love with, and less like the luxury sedan they tried to turn it into in the 70's. I spent the next two years acquiring the parts to convert this vinyl topped SE into a coup. I searched junkyards all over the country trying to find the roller windows, trim, moldings and other parts. I had lots of work to do, both mechanical and body. Ok, I know what you're thinking. You're thinking "Hey, it's cool but he just copied the Charger from Burn Notice on TV." Well you're wrong. The thing is, I bought this car in January of 2004. I had it finished and on the road more than a year and a half before the Burn Notice show even started. And since I don't have cable TV, I didn't even see Burn Notice until a few weeks after I sold this Charger in 2008. Ironically, the guy who bought the car from me told me all about the show. Naturally he was a big fan, and insisted that I must watch it. So I looked it up on a Hulu and there it was... my car... almost. And the show's pretty good, too. Sadly, I did sell the car so I no longer have the joy of driving that beautiful machine. I do miss it, but life is full of opportunities and I'm always keeping an eye out for the next project. Who knows, maybe that '68 Charger I've been waiting for will pop up when I least expect it. I know some purists out there might be upset that I changed my '73 from a vinyl top SE into a coup, but I think it was a major improvement. And frankly, SEs aren't exactly in demand. They're not that great looking, IMHO. So what do you guys think? My name is Johnny and I just met the guy who has this Charger that was used in the movie Unlawful Entry. He said it has a 340 in it, the same hood scoop and does not have anyway of documenting that this is the real deal other than information from the guy he got it from. He lives in Loomis Ca. Wow, that would be a cool find. I have to look up Unlawful Entry and watch it... I'm pretty sure I saw it back in the day but I don't really remember it. If it has the same scoop as mine, they're commonly known as "six-pack" scoops and I believe only came from the factory on cars with a six barrel intake (mine didn't). It would be interesting to know if your friend's car was a factory setup or not. Anyway, thanks for the cool story and the heads-up on the movie. That's a freaking awesome great job! Plus I'm a big Burn Notice fan so it would've been cool with me if you wanted the same car. Haha. How much did the body cost? And then the work? I'm thinking of restoring my own 1973 Charger. Thank you very much. Now that I've been watching Burn Notice, I'm a fan too. Great show, and you anything with Bruce Campbell's got to be good, right? As far as the cost, I didn't really keep track. If I remember right, I bought the car initially for about $5,000. My guess would be that I spent about $2500 on parts, auto body supplies, and paint. That includes buying a few tools, but I did all of the labor myself. I bought it online but unfortunately, I don't remember where. It was a fiberglass scoop (of course) which I bolted on. I used a mushroom-style intake on the carb, with a rubber gasket that sealed the intake to the hood. In other words, it was a genuine ram-air intake, and not just there for looks. I love it! What are the size for the tires? same size? or is the back a little thicker? Sorry, I don't remember what size they were. The rear tires were a couple sizes up from the front. They were both taller and wider. If I recall, the front rims were 14" and the rear were 15".